Large double-lid donabe rice cooker, Kamado-san (5 rice-cup size). 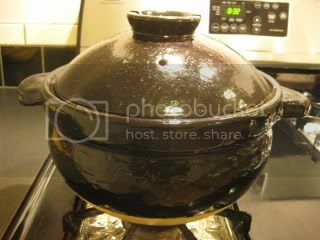 This is a great donabe rice cooker for feeding a larger group. And the rice cooks just as perfectly as our "regular size" (3 rice-cup size) Kamado-san. I got the beautiful "okoge" crust, too. 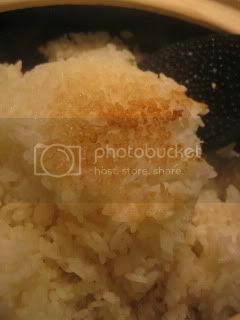 To serve on top of this shiny Kamado-san rice, I made Niku Miso with my Soup & Stew Donabe, "Miso-shiru Nabe". Niku Miso (ground pork with miso topping) goes really great with freshly-made donabe rice. 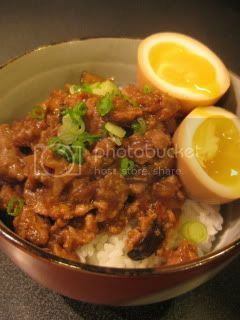 Here's my basic niku-miso recipe. This time, I tweaked it a little by adding more miso, and finishing it with kuzuko (arrowroot starch)-water mixture to thickn it. The dish was served with "aji-tama" -my 24-hour marinated soft boiled egg (in soy & dashi based marinade).